This is an issue that really takes advantage of the world-building that Marvel have been taking great pains to employ. After all, the comic guest-stars a hero who has his own magazine (showcasing their first meeting, in fact - despite Spidey having been emblazoned upon the cover of Daredevil #1), and featuring a set of villains which debuted in the title of yet another! 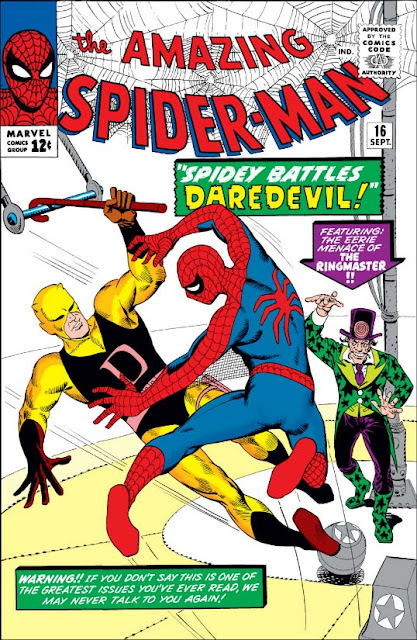 And Lee & Ditko's use of Daredevil really is an effective one; the story doesn't feature the hero only in mighty action scenes - as so many guest-spots tend to do - but also illustrates more character-driven ones, such as Matt Murdock's interactions with Foggy & Karen back at his law office. It even touches on the "But I mustn't reveal my feelings!" romantic subplot which most of Stan's solo heroes seem to have at this point (cf. Iron Man and Thor, for instance). 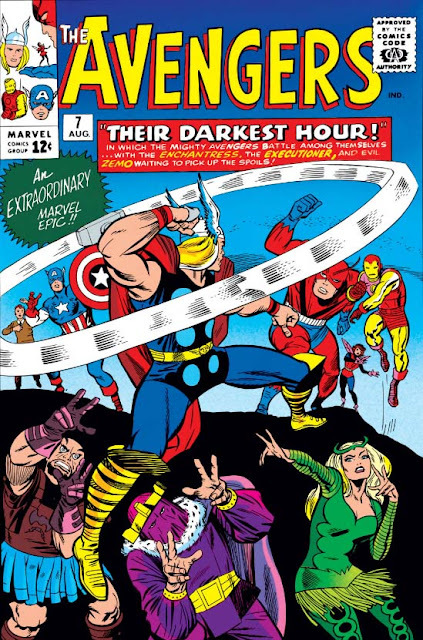 the retouched Marvel Masterworks version. 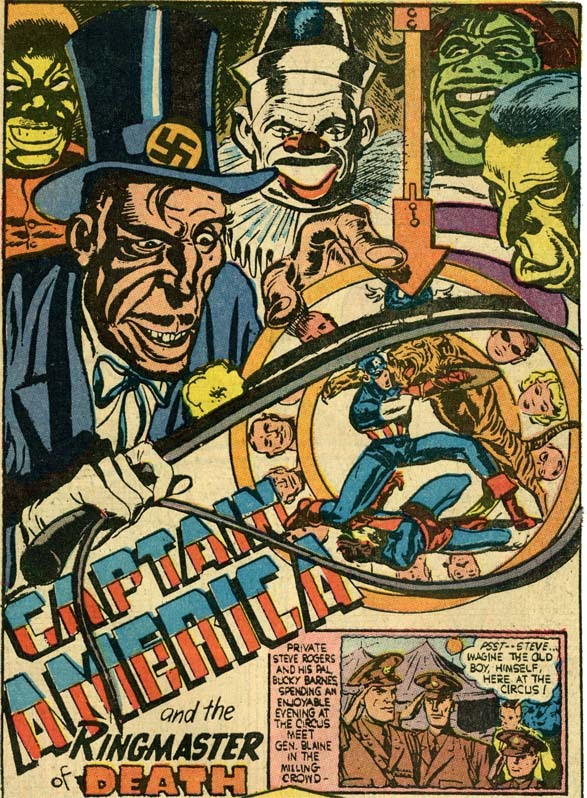 Circuses may have long passed their heyday, unable to compete with the fast & flashy home entertainments available now, but the continued appearance of such a setting in these comics (including, you'll recall, The Avengers #1) shows that they still had a viable presence at the time. In fact, Barry Pearl points out that the Circus of Crime is a concept that Stan Lee just couldn't seem to let go of! 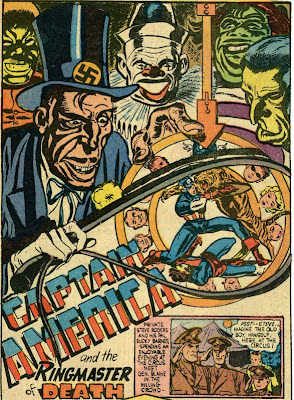 An evil Ringmaster first appeared in 1941's Captain America Comics #5 - and though that may have been a Simon & Kirby production, Stan certainly would have been aware of it, as he was already working for Marvel at the time (and in fact had a couple of contributions to that selfsame issue). 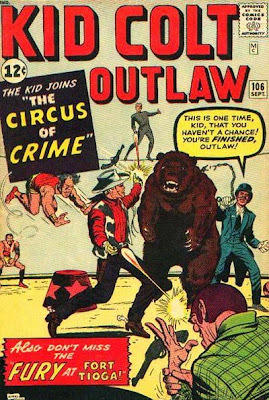 And if that's not enough, Stan also featured a Circus of Crime in June 1962's Kid Colt #106 - in fact, just one month before debuting the Ringmaster's circus in The Incredible Hulk! Early versions of the villains. 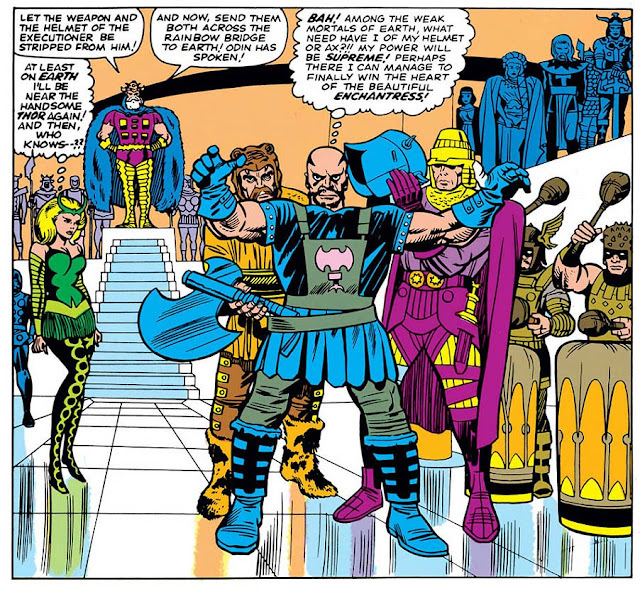 As entertaining as the comic may be, it's also undeniable that the plotting is, as ever, a bit nuts. 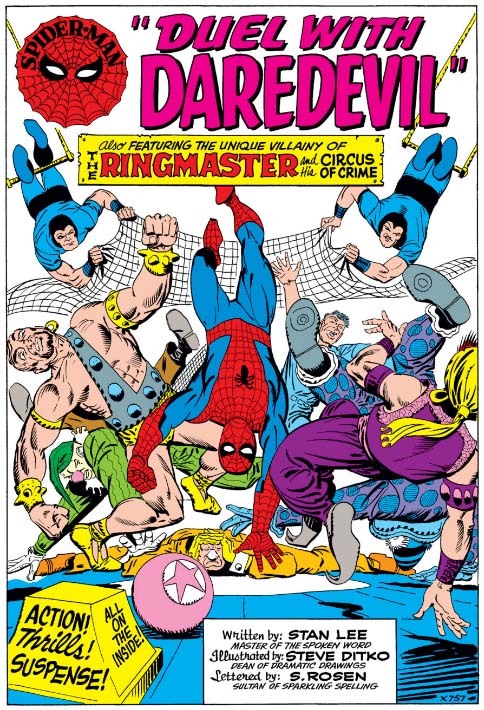 To entice audience members to come to the circus, and thus provide a full house ripe for the thieving, the Ringmaster advertises that the show will feature the performances of a certain daring Spider-Man! And yet when Peter inevitably spies ones of these circus posters, rather than suspecting that something may be afoot, he instead thinks: Hey, maybe he should go! (Matt Murdock likewise hears about it, and joins Foggy and Karen in attending.) Interestingly, Spidey performing ostentatious antics can't help but recall (intentionally? or not?) 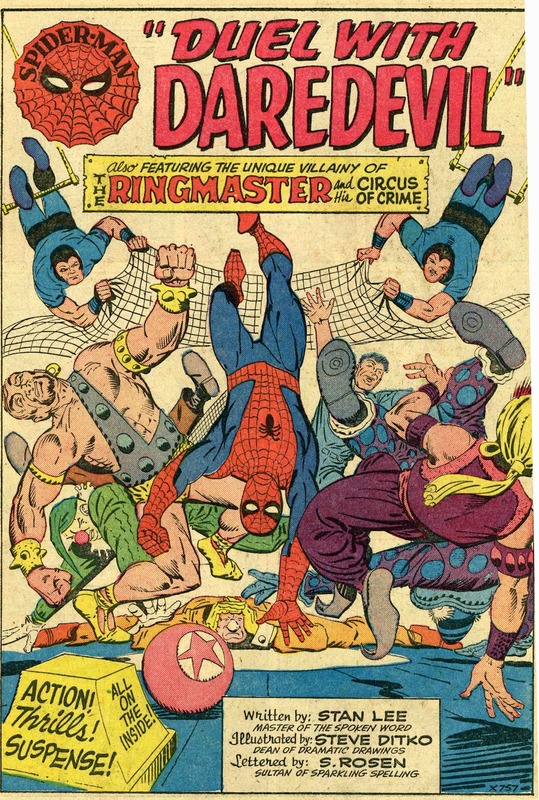 memories of his show business obsessions in Amazing Fantasy #15. Despite everything he's learned about priorities and responsibility in his still-fresh career, he's still an insecure kid craving the accolades and attention of the crowd. 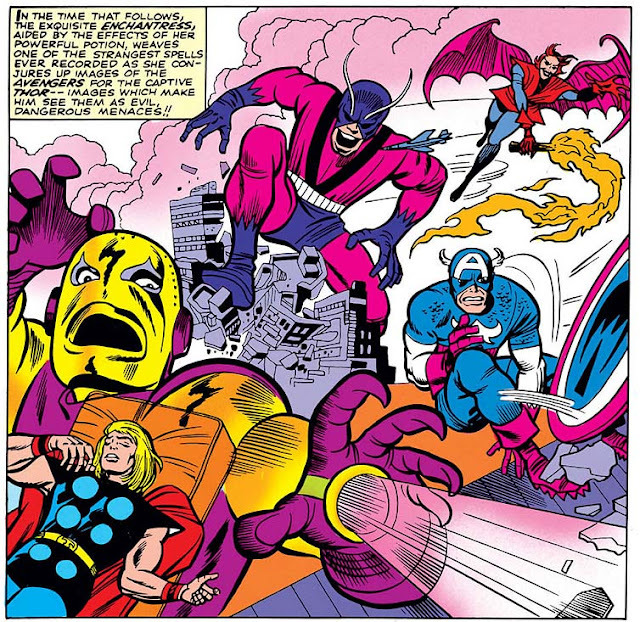 Ditko's rendition of Daredevil is incredibly appealing!